Update: Clubhouse will be available for hanging out and partying from NOON onwards. Meeting and dinner will commence at 6 pm. We'll post updates as we see how the flying weather turns out. Please don't forget your $20 dues. I think I have a volleyball but if anyone else has one please bring it just in case. See you all there! Once again, we are grateful to Rich for securing us a venue at the clubhouse of the Hawaiian Trail and Mountain Club in Waimanalo. This time we will have the posh party pad to ourselves for the entire day! If the weather cooperates, we can fly at Makapuu and land near the clubhouse at the beach. We'll call the meeting to order at 6 pm, to make quick work of our agenda, and then we can relax for the rest of the evening. This is our last meeting of the year, so we will be signing up members for next year, and also electing our board of directors. Please bring $20 for dues and a bit extra to contribute to the BBQ fund for the day. As usual, we will impose on Peter to provide meat for us to grill, and we encourage everyone else to bring pupus, side dishes and beverages to share. Please check back here for updates regarding the timing and the agenda. 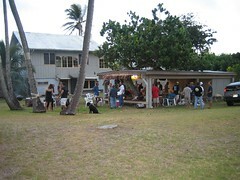 The clubhouse is located at 41-023 Puuone Street. Please mark your calendars and join us for a fun day of flying and partying! The Kahana Marching Band versus the Makapuu Backwards Flying Club, sorry I have to work that day and will miss the fun. Dave, I know you like the Marching Band metaphor, because I've heard it from you before, but I have to admit I never really understood the joke - I'm sure there's some reason that it's funny, but it must be over my head. Nothing unusual about that. Sorry to make you explain it again. We'll miss you on Saturday but I appreciate that you're willing to take the hit and get automatically re-elected without even being there to protest! Kahana Marching Band comes from Doug, but in my mind I picture a bunch of merry minstrels (and you know who you are) singing flying songs and hiking to launch day after day. Though I have to admit there are less two-way hikers these days. I might have a little flight at Torrey tomorrow, just to dust off my gear here, maintenance of course. Alex, as long as there is room for me on the board after you, Bob, Ray, Q and Slacker! How about the the Tandem Tea-totalers vs. ? Winner of the 1st round. Bob, you get to work net? who would be interested in a GPS clinic?? Spoke with Tom Mendez (HTMC President). There was a slight error in our last meetings' cleanup...., So minor that he couldn't quite remember the exact issue; "Something to do with mixed trash or something". There is now a club resident; her name is Ellie. I trust that we will treat her like a Sister if she's there during our event. The club volleyball gang will not be playing that day, so we'll have the place pretty much to ourselves. Let's hope we get some nice XC weather with pilots landing on the beach en mass! There may be a couple of other HTMC club-members there...., No problem. We'll treat them like our own Right? I'll probably be there to open up @ 10:00am. I don't have to be there the whole time so if one or more of ours is there, then maybe I can take a FLY-BREAK & join U-all later. Forecast looking like 50% chance of rain so bring pop-ups if U can. I'll bring the lighting stuff & pop-up I brought the last time. NOTE:- ALL PILOTS; Please do NOT land @ the clubhouse. Land on the beach 2 blocks north of Waimanalo beach park or thereabouts.